Children Jewellery from KAYA, tangible reminder for later! 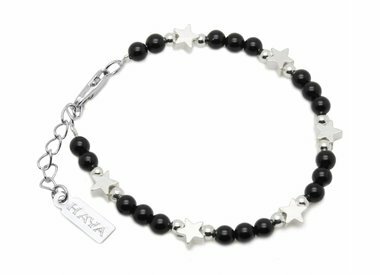 KAYA makes luxury children's jewelry to commemorate special occasions such as christening, communion, birthday or wedding. And for special people, bridesmaids, sisters or best friends! No plastic or wooden jewelry for children, but real children's jewelry made of the finest materials such as freshwater pearls, gemstones and crystals. All children's jewelry are delivered in a luxurious silk sieradenbuideltje with silver cleaning cloth, equally ready to give. So you have a really quality jewelry that will last for years, and later a tangible reminder. Going on kraamvisitie and do you want something different to the brand new mom give you a hug bug? A baby bracelet of shiny pearls is the perfect baby shower gift to surprise your pregnant sister or friend! Very sweet to her plump babypolsje for her first photoshoot and later a tangible reminder of her babyhood. Want more unpack? We have many children's jewelry matching bracelets for mom to wear with her baby, how sweet is that? Hand knotted children chain: make her outfit at all! In addition to our extensive collection of children's bracelets KAYA also has a collection of children's necklaces. Make her perfect outfit with some beautiful set. Made from the finest freshwater pearls, one at hand knotted on silk for added strength. So the shiny children's necklace is extra strong and flexible, which is wonderful for little ladies. With a price of € 21.95 not for nothing that one of her bestsellers KAYA! Because KAYA jewelry heart for all children, donates brand children's jewelry sold by an amount to a foundation that makes it possible for children in Gambia to go to school: perhaps the most beautiful jewel that is there.